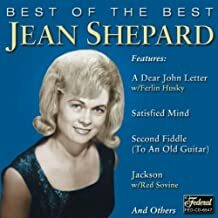 Jean Shepard lyrics represent a super lady with an enormous talent. These Classic Country lyrics with chords will help you enjoy playing and singing real country music. Jean Shepard is a true pioneer for women in country music and has been a member of the Grand Ole Opry for more than 50 years. Music was a big part of her life at an early age and she played bass in an all woman band as a teenager. Hank Thompson was a big influence in her early career and helped her sign with Capital Records and the rest is history. A great lady with such a great voice for pure country music.